Textiles are often used in churches, but St. Mark’s has one by Josh Faught that’s a little different: a woven work that touches on gay politics and a supernatural soap opera. The St. Mark’s dean says it’s a natural complement to the church’s work. It’s not unusual to see symbolic textiles in a cathedral. More unexpected, perhaps, is a monumental woven work that touches on gay politics, sexual encounters and a supernatural soap opera. 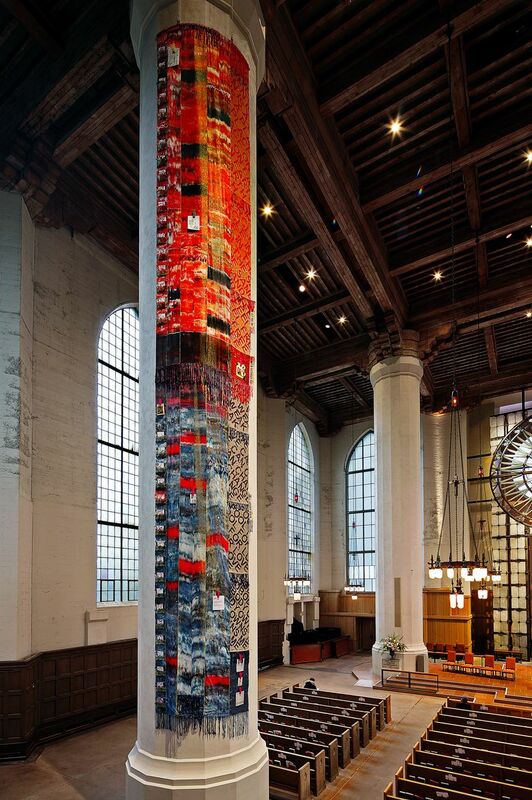 But there it is, “Sanctuary,” a 45-foot-tall textile by San Francisco-based artist Josh Faught, hanging from a massive pillar in Saint Mark’s Cathedral on Capitol Hill. The art piece was born out of a partnership between Saint Mark’s and Western Bridge, an organization that once functioned as a contemporary art exhibition space. After closing the physical location in 2012, Western Bridge has gone on to commission contemporary works in a more “itinerant” way. 8 a.m.-7 p.m. most days, check website for service times, through July 31, 2018, Saint Mark’s Episcopal Cathedral, 1245 10th Ave. E., Seattle (206-323-0300 or saintmarks.org. Western Bridge: westernbridge.org). 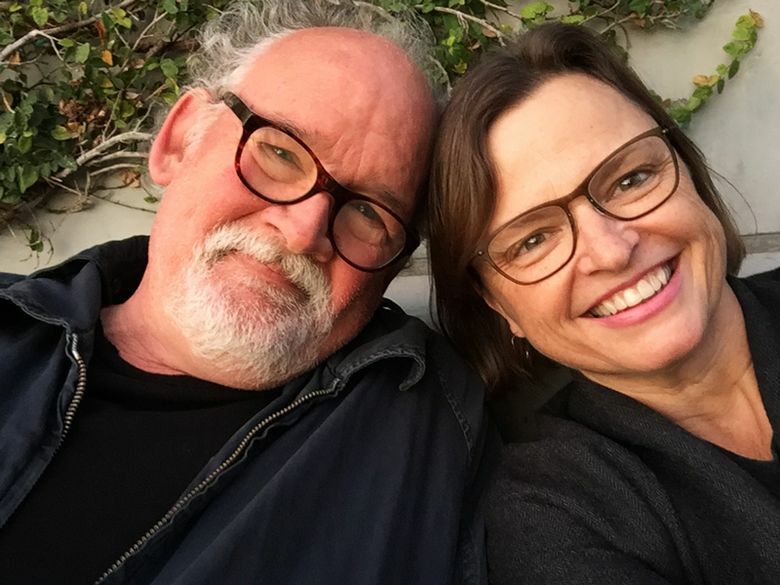 The forces behind Western Bridge are Ruth and Bill True, astute collectors and active supporters of the arts. Western Bridge now seeks to “go beyond gallery walls to create community experiences with art,” Ruth says. The partnership with Saint Mark’s could be tied to Ruth’s history with the church — her grandfather helped build the cathedral and her grandmother was a longtime member of the Altar Guild — but it also arose from casual conversations between the Trues and Saint Mark’s dean and rector, the Very Rev. Steven L. Thomason. The Trues identified Faught, a self-described gay Jew from the Midwest, as someone who could create a piece that would “hold its own” in such a large space. As you enter the cavernous cathedral, the giant textile welcomes you, soaring to the ceiling with its gorgeously woven pinky reds and deep blues. Paraphernalia from Faught’s personal collection and Seattle’s cultural past are attached here and there, but often hard to see from ground level. Running down the banner’s right side are woven words that are repeated and jumbled but quite visible, even from across the nave — “Heaven is a Place on Earth,” “Nobody Owns Me,” “We Can Change” — all song titles from a 1987 album by former Go-Go’s lead singer and gay icon Belinda Carlisle. The piece is layered with complex musical and romantic references, some of which take the form of a hymnal, resting on a stand at the foot of the pillar. You can flip through sheet music, ads from Seattle’s 1980s gay scene, or a sexual questionnaire. The whole experience is a mash-up of bodily and transcendent experiences. It blurs lines between personal and social histories, high and low culture, and ideas of what’s sacred or profane. Faught developed a plan to unify personally meaningful connections with Carlisle’s album and the dystopian soap opera “Passions,” DVDs of which now rest in pockets attached to the left side of the piece. From there, he wanted to “ground the fiction of the work to something local, to something real.” Faught and Western Bridge representatives Anne Fenton and Eric Fredericksen discovered the archives of Peter Hallock, the founder of Saint Mark’s Compline Choir, and the archives of Tim Mayhew, a Seattle activist. Within Mayhew’s collection, Faught found ads and news articles related to “The Monastery,” a notorious, now-closed queer club founded in a deconsecrated church in 1978. After its closing in 1985, past attendees described it as both a den of sin and a safe haven. Its nickname, “The Sanctuary,” suggested the title for Faust’s work. Today, in 2017, the title takes on additional meanings as churches and cities declare themselves sanctuaries against discrimination and prejudice, associations that couldn’t have been foreseen by the artist and organizers when the project was proposed. “We’re living in a dark, scary moment in our country’s history, and although this work doesn’t speak as urgently as a protest in the street, in the end I hope this project starts to suggest that if political rhetoric is, at its core, a desire to communicate, the ability to speak through textiles allows us to embrace a personal/political continuum that is at once inclusive, fragmentary, experiential, physical and radical,” Faught says.